There was no question: of course I was available to interview Adam Sandler, Kevin James, Josh Gad, Michelle Monaghan and Chris Columbus! Wouldn't you be? As the press junket day approached, I learned that the roundtable interviews had changed to a press conference. That meant I probably wouldn't get a picture with all those talented people, but everything else remained the same. Before I knew it, the day of the junket arrived so I made my way over to the Times Square Dave & Buster's and waited for the press conference to start. I've interviewed a number of celebrities, but I have to say that the Pixels press conference was absolutely the most entertaining celebrity interview I've ever done. I was selected to ask the first question (yay!) and I was excited to ask Josh Gad something more than one of us wanted to know. What was it like working with Adam Sandler and Kevin James for the first time? Adam Sandler (AS): Oh, that's a good question! JG: It was a nightmare! No, it was truly a dream come true. Look, the fact of the matter is these guys have been idols of mine forever. I grew up in the generation of Adam Sandler being on SNL and watching it religiously. That cast was my cast. It was like my Belushi. Although you were more like my Gilda. And Kevin [James]. I feel like Kevin and I are cut from the same cloth. I've always wanted to work with him. Chris Columbus, enough can't be said about the fact that he defined my childhood. Goonies and Gremlins were the movies that defined Josh Gad and made me the national nightmare I am today. Michelle, how did it feel playing the girl power in the film? Michelle Monaghan (MM): It felt awesome! I think what was exciting, really, the job title and the name really got me for this film. She's lieutenant Colonel Violet Van Patton. I could not say no to that! she's a weapons designer for the government. MM: She's confident! She's got beauty and brains and brawn. That's what I love about her. The movie is about video games. Did any of you play classic arcade games in preparation for the film, and what did you play? Note: this question was asked by Faith, 12 year old girl attending the press conference. AS: That's awesome Faith, good question! Chris Columbus (CC): I only knew Donkey Kong and Pac-Man. I was a little older so hanging out in an arcade would have been kind of creepy for me. When I was at NYU I'd play at a bar, but when I got the movie I had to learn a lot of games like Galaga and Centipede. But these guys were experts. AS: We loved it. It was our whole life growing up. We were 12, 10 years old. That was a big deal. The arcades opened up. KJ: That was the thing. It was out of the house! AS: You got to leave the house! Your parents said ok. There were girls there, there was some food. There were tough kids you were scared of. I remember you got to take the bus. Ours was downtown. It was called The Electric Dream Factory, just like in the movie. You got on the bus, you hung out with a couple of your friends, your parents gave you, like, a dollar. You could choose to play one game and spend seventy five cents on a McDonalds hamburger, or you could play all four games and have nothing to eat. KJ: Guess which one I chose? [laughing] I never played! The bus would drop me in front of the arcade and I'd just walk to McDonalds. The scene where you're playing Call of Duty. Was there any specific message you were getting at in the scene? AS: It's not too preachy. Some of the games, they're amazing. What's happening today with the video game world, with how realistic it all is. There's violent stuff. In the 80s the games were a little goofier, but you were still shooting stuff and blowing up planets and getting chased by things trying to kill you. But it kind of seems like the 80s versions are more innocent and the colors are more friendly. MM: They're a little more gender neutral, as well. Those old 80s games. AS: It's not a powerful message, but it is saying that there's a difference between the games back then and the games now. I love your comedic timing. Did you have any ways to go away from the script and ad lib? AS: We've always believed in ad-libbing but not as much as Josh Gad over here. MM: That scene when we're talking to the Navy Seals. That might go down as one of my favorite days ever on a film set. It was also one of the worst because we could not keep a straight face. Those guys are nothing short of miraculous. We were shooting an R-rated movie for a little bit. That was a lot of amazing and brilliant improv. AS: Every day Josh Gad was in a scene was bananas. KJ: the crew actually chipped in and bought him a car because of all the overtime! AS: Me and Kevin were like, ‘This guy [Josh Gad] is young and excited and he likes being here!' We were like, ‘We gotta get home, man!' It was great. Loved him. Genius boy. There were so many great, hilarious quotes in the movie. What were some of your favorites? JG: I love it when Pac-Man says, Wagga Wagga Wagga Wagga. [lots of laughter] I think that was one of my most memorable moments. AS: He didn't initially want to do that! [laughing] Chris had to talk him into it. MM: I liked the scene with Professor Iwatani, when he was like, ‘My sweet boy.' and it cuts to Josh and he's like, ‘it's so sweet!' and it turns completely sideways. I love that beat so much. JG: There are so many great ones, but I think Peter Dinklage's lines are so insane. The way that someone carries himself like that. The overconfidence kills me. AS: Iwatani though, that was the best. We wrote this script a bunch of different ways. Columbus had the script and he sent it over with all the Iwatani stuff. That was the hardest I laughed. That was all Columbus. CC: The funny thing is that we were dealing with a lot of game companies to get the rights…who really, really loved their characters. I had had so many conferences and at one point, I was like, what if one of these guys is a little crazy and really thinks that one of the characters is his son? [laughing]. That's exactly where that inspiration came from. How was it on the set? You all are so amazing, it seems like it would be such a great time! AS: Every combination was great. Everyone you're talking to was a great time. There wasn't a person you hung with that didn't have a great time. 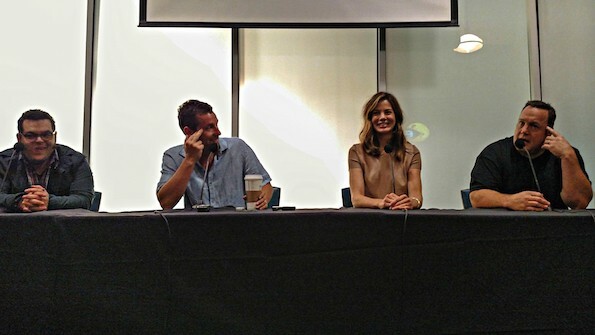 Like I said above, the press conference was hilarious, and I loved recapping it for all of you! This interview is the first part of my 3-part series on Pixels. Stay tuned because I have a full Pixels movie review and another fun post coming later this week! 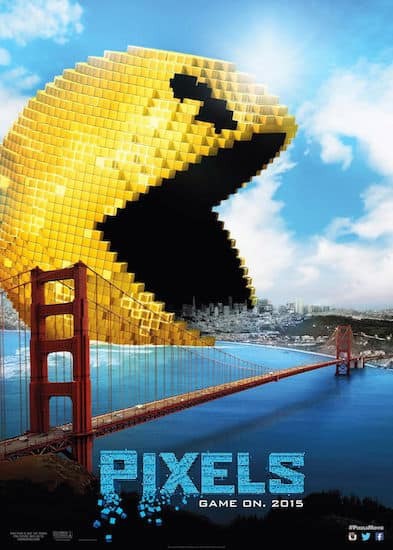 Pixels opens everywhere on July 24th. Get your tickets today! I can’t believe you did this! That’s a lot of humor in the same room. You’re telling me, Mark! It was definitely a once-in-a-lifetime event for me! I just learned about this movie. Adam Sandler is my favorite. I’m so jealous of you right now! LOL, Kristie! There were two kids in the press group and Adam Sandler was so nice to them. I was super impressed with how he was so welcoming and appreciative with them. Holy moly, MB. This looks amazing! how exciting! It WAS amazing, Mara! Absolutely the funniest interview I’ve ever done!